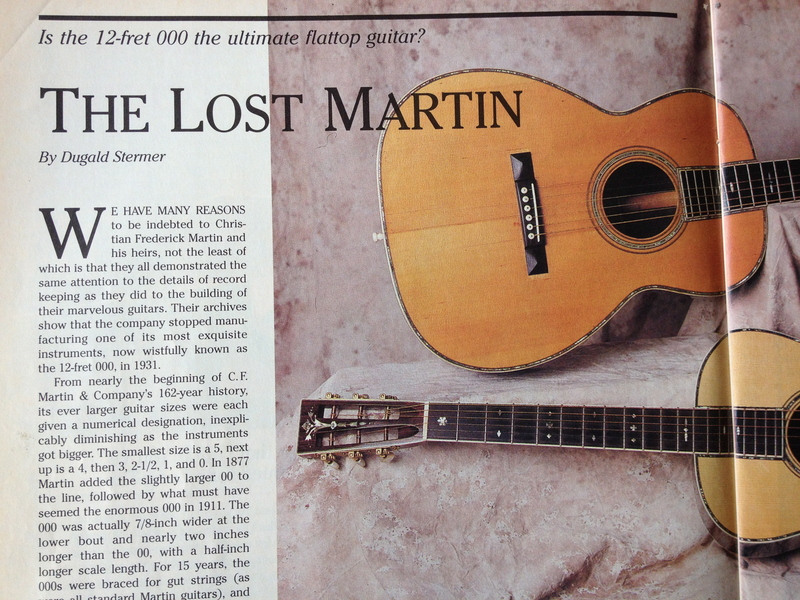 Like many guitarists I’d become interested in small bodied Martin’s after watching MTV’s Eric Clapton Unplugged where he played a 000-28 and a 1939 000-42 that had been converted by the factory to Style 45 appointments. After reading an article in the March/April 1995 edition of Acoustic Guitar magazine it wasn’t long before I’d decided that I ‘needed’ the ‘the ultimate flattop guitar’ – the top of the range small body that Martin ever made – the 000-45. Walter Carter’s excellent The Martin Book, Mike Longworth’s authoritative Martin Guitars: A History and Gruhn & Carter’s Acoustic Guitars and Other Fretted Instruments all seemed to agree that the 000-45’s made in the late 1920s and early 1930s were generally held to be Martin at it’s very pre-war best making a guitar with a perfect balance of tone and volume. As vintage examples were very rare and when available selling somewhere North of £50,000 I decided to ask the Martin Custom Shop to produce a modern replica. This was a little before Martin cottoned on to the business opportunity of recreating classic models but Martin were very switched on to what i wanted. 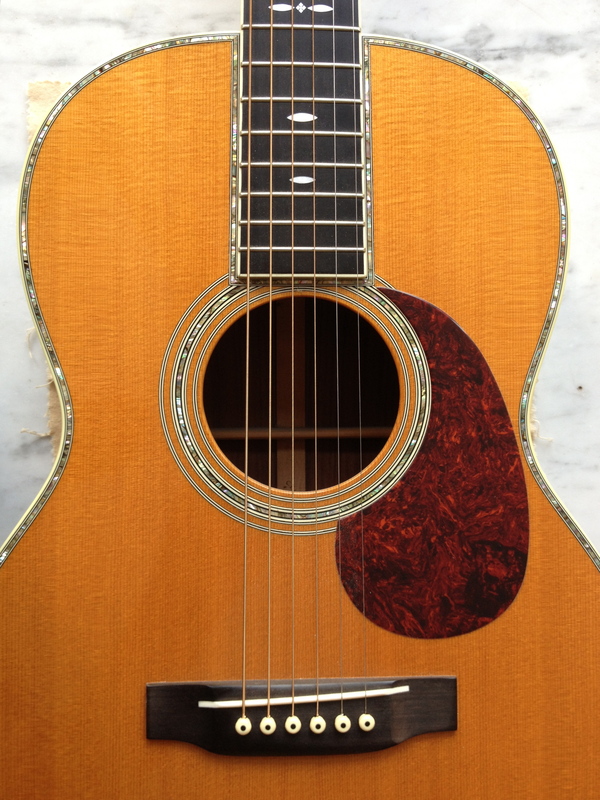 The final spec of the final guitar was effectively that of a 1929 000-45, Martin probably made about 100 examples of this model from 1929 through to 1931. Apart from Indian rather than Brazilian Rosewood and modern construction materials – hide glue was not an option, although I did ask! – everything was as close to a 1929 example as they could get… slot-head, long-saddle belly bridge rather than the pyramid bridge of the mid 1920’s, rounded 000 shape (rather than the more square shouldered version that became the 000-42 EC model), old 1929 style makers stamp on the back of the headstock and on the inside binding strip, the highly coloured wood inlay where the two sides of the back joins together and a pick guard… something, along with the belly bridge that was first introduced in 1929. It looks great and plays so easily, with wonderful tone… something that, as with all quality guitars, gets better every year. I’ve had the 000-45 for about 16 years and it sits at the top of my small collection of classic acoustic guitars.